The Delavan Hotel is a 60 room boutique hotel and spa that is elegantly equipped with all the amenities you could ask for during your stay. 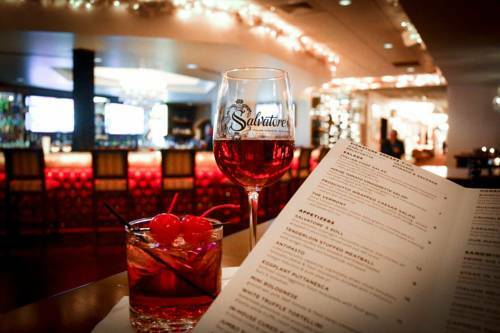 We have an onsite fine dining Italian steakhouse called Salvatores Italian Gardens that is one of Buffalo New York top restaurants. Our property also has over 20000 sq ft of meeting space over 5 banquet rooms. From a business trip to a getaway The Delavan Hotel has something for everyone. All of our stays include Complimentary breakfast wifi shuttle service to Buffalo International Airport business center with prints and fax valet service in room coffee and a full fitness center. We also have a full salon and spa room service and a full service dining. The name The Delavan came from Salvatores Hospitality first restaurant that started in 1938 on East Delavan Ave in the city of Buffalo. The company has since grown from there to now have 2 hotels a restaurant banquet facility and does full service off premise catering. Chandelier Bar: Our Chandelier Bar is a upscale casual dining area that serves a verity of craft cocktails over 30 wines by the glass and a wide array of craft beers. Our menu is anything from our Italian Reuben to Grilled Tenderloin. Our property is located 2 miles from the Buffalo International Airport. We offer complimentary shuttle service to and from the airport on an as needed basis. There are an array of restaurant lounges and bars all within a 5 minute drive of our property. We also have an onsite restaurant lounge and offer room service to our guests.